Producing beef currently requires cows, and that is a problem, according to Eshchar Ben-Shitrit, founder of Tel Aviv-based food printing startup Jet-eat Printed Food Ltd. Founded in early 2018, Jet-Eat develops 3D printing technologies for vegan meat substitutes. The printed “meat” is designed to emulate the appearance, texture, taste, and reaction to heat of beef. “It takes 20,000 liters of water and over 20 kg of cattle feed to produce 1 kg of meat, that is just inefficient,” Ben-Shitrit said. Jet-Eat aims to develop a printer that could produce in 24 hours an amount of meat substitute equivalent to the amount of beef that could be produced from a two-year-old calf. 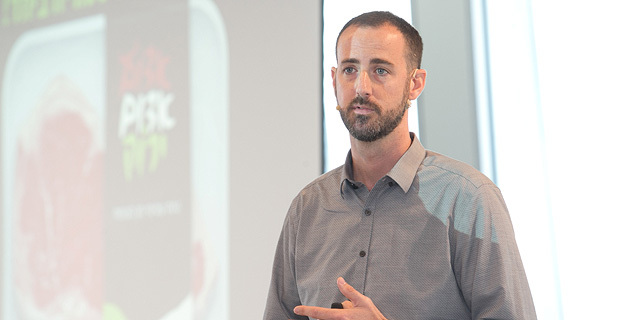 Ben-Shitrit spoke at a pitching event held Wednesday at Tel Aviv coworking space Labs, as one of 10 finalists in a foodtech competition held by Calcalist in collaboration with Israeli food processing company Tnuva and accounting firm KPMG. “Our steaks already cost the same as beef products and will get much cheaper in the future,” Ben-Shitrit said.